Fairfield Inn Broadway at the Beach - Just steps away from the area's center of shopping, dining and entertainment. And what a destination it is! It's acre after acre of great entertainment and exceptional dining in more than a dozen fabulous restaurants including the Carolina's only Hard Rock Cafe, Planet Hollywood, NASCAR Cafe, Jimmy Buffet's Margaritaville, Key West Grill, and more. Broadway ATB is also home to more than 100 unique specialty stores and boutiques, the new Ripley's Aquarium and its renowned collection of fascinating marine life, miniature golf, movie theaters, and more. Myrtle Beach Hilton - This resort hotel sits right at the oceanfront with 385 luxury guest rooms, all with spectacular ocean views and private balconies. Fall asleep to the rhythm of the ocean waves and awaken in time to see the sunlight streaming through a unique atrium lobby. 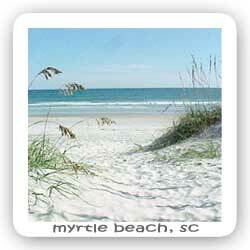 Full of southern grace and charm, this relaxing oceanfront resort is a favorite of vacationers traveling to the area. Courtyard Barefoot Landing - The hotel designed by business travelers, Courtyard surrounds you with all the conveniences that make business and pleasure travel easy. The Courtyard Barefoot Landing is conveniently located .3 mile from Alabama Theatre and Barefoot Landing, half a mile from Briarcliffe Mall, nine miles from Escad Industries, ten miles from Hard Rock Cafe and Broadway at the Beach, 11 miles from the Convention Center and 20 miles from Coastal Carolina University. Best Western Carolinian Beach Resort - This resort offers tastefully redecorated deluxe sleeping rooms with private balconies sporting a view of the Atlantic Ocean, an in-room safe, complimentary coffee, hairdryer, iron and ironing board, cable television, and refrigerator. Beautifully decorated efficiencies offer all these amenities plus full kitchens completely stocked with the necessary kitchen utensils. Whether you spend your day walking the beach, frolicking in the ocean, combing the beach for shells or lounging in our oceanfront pool, you'll find this the perfect location to spend your vacation. Comfort Suites - This beautiful property is close to Broadway at the Beach, the area's most exciting attractions, the ocean, championship golf courses, shopping, dining and night life. Free transportation is available to select attractions. Staybridge Suites - Guest have a choice of three spacious suite accommodations: a studio, one bedroom, and a two bedroom/two bath. All suites feature fully-equipped kitchens, including microwave, coffee maker, and apartment size refrigerator with icemaker. Holiday Inn on the Intracoastal Waterway This hotel is located at the gateway to South Carolina's Grand Strand and overlooks the beautiful Intracoastal Waterway. It is minutes from the blue Atlantic Ocean and convenient to all area attractions. Shoppers will love the Pottery at Waccamaw and Factory Shoppes and the Fantasy Harbour entertainment complex, which are located adjacent to the hotel. Broadway at the Beach is just minutes away. Hampton Inn and Suites Oceanfront - The Hampton Inn and Suites is located on the ocean and is within minutes of Broadway at the Beach, shopping, golf, two piers, restaurants and entertainment. Fairfield Inn Briarcliffe - The Fairfield Inn places you within minutes of fabulous shopping, dining and exciting attractions for all ages. Colonial Mall has more than 50 retail shops and upscale department stores, 10 movie theaters and food court are all adjoining the hotel. Cracker Barrel, Red Lobster and other full service restaurants are all within a mile of the hotel.